Chefs Derek Patterson of The Plough Group, Adam Harding from The Hillside and Danny Millar of The Parson's Nose with Alderman Allan Ewart MBE, Chair of Lisburn and Castlereagh City Council's Development Committee. 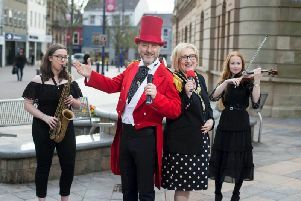 Lisburn and Castlereagh Treat Week has announced details of two exclusive Translink Travel Centre Gastro Trails to Hillsborough and Moira during the council-backed restaurant week, which starts on Saturday, February 24. Chefs Derek Patterson of The Plough Group, Adam Harding of The Hillside and Danny Millar of The Parson’s Nose joined Alderman Allan Ewart MBE, Chair of Lisburn & Castlereagh City Council’s Development Committee, to launch the initiative. The Gastro Trails will take place on February 28 and March 1, with a return coach from the Europa Buscentre, Belfast included in the ticket price.